Like ostriches and emus, rheas are large, flightless birds. They live in South America on the grasslands of Brazil and Argentina. 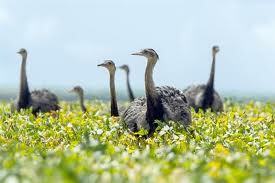 They only stand 4 feet high and they look like small ostriches. All about Rheas – they are large, flightless birds. They live in South America on the grasslands of Brazil and Argentina. Rheas just might be the best dads in the animal kingdom. Male rheas build large nests on the ground. They mate with more than one female. All the females lay their eggs in one nest. Sometimes a nest can hold as many as 50 eggs! That’s a lot of kids! The dads sit on the eggs and take care of the babies after they hatch. They won’t let any animals come near – not even the females. 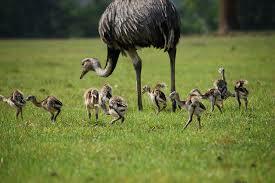 The male rhea takes care of the babies for up to 6 months and even adopts other baby rheas that become lost. The male rhea takes care of the babies for up to 6 months and even adopts other baby rheas that become lost. 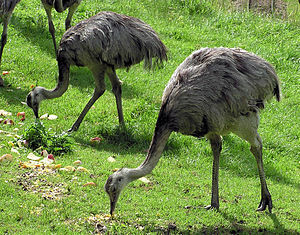 Rheas eat almost anything they can find. They like plants, fruit and seeds. They’ll also eat lizards, bugs, birds and small mammals. Farmers don’t like rheas because they eat crops. 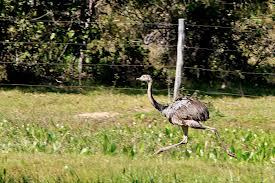 Rheas can’t fly, but they can run fast. They use their wings for balance when they’re running. Rheas live in big flocks except during the breeding season. Sometimes they live with deer and other animals. People hunt the rheas for their eggs and meat. Rheas live in big flocks except during the breeding season. A video about the male rheas sitting on the egg. Question: What color are rheas? Answer: Most rheas are gray, although they can be brownish gray or even white. Question: Do rheas sing like other birds? Answer: Rheas have a loud roar that sounds more like a mammal’s cry than a bird’s. Enjoyed the Easy Science for Kids Website all about Rheas info? Take the FREE & fun all about Rheas quiz and download FREE Rheas worksheet for kids. For lengthy info click here. Declan, Tobin. " Fun Rheas Facts for Kids ." Easy Science for Kids, Apr 2019. Web. 24 Apr 2019. < https://easyscienceforkids.com/all-about-rheas/ >.